If you’re looking for a healthy, yet very satisfying meal, stir fry should be the obvious choice. 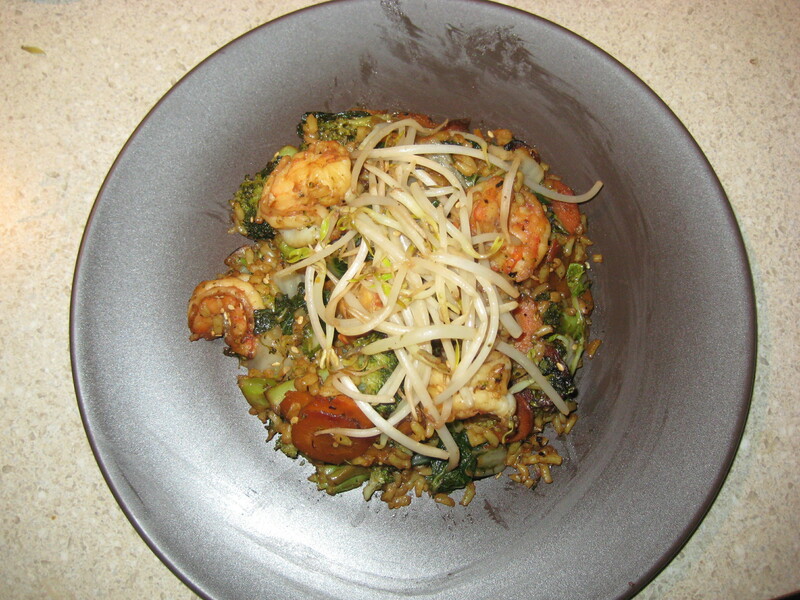 It has tons of vegetables, protein, and, if you use brown rice, a healthy serving of whole grains. I love when stir fry is made with shrimp! Place a large skillet over medium heat. Add 2 tablespoons of vegetable oil to the pan. Sprinkle the shrimp with salt, pepper, and garlic powder. When pan is hot, saute the shrimp until firm and pink, about 4 minutes. Take shrimp out of the pan and set aside. Add 2 more tablespoons of oil to the pan. Throw in the broccoli and Bok Choy. Stir fry for about 4 minutes, until tender. Add the mushrooms and carrots to the pan. Continue cooking until all vegetables are tender, and season with the remaining salt, pepper, garlic powder and ginger. Microwave the rice according to package directions. Add the cooked rice to the pan with the vegetables, and pour in the soy sauce and vinegar. Mix together, then add the shrimp back to the pan. Remove from heat. Sprinkle the sesame seeds on top, and garnish each serving with bean sprouts.